For those who have patiently followed the gradual but steady success of Dangote Cement and its push across the African continent, there is no doubt that Alhaji AlikoDangote, brain behind the Dangote Group is clearly a man on a mission. Ranked by Forbes magazine to be worth $25 billion in 2014 and 26th richest man in the world – although this has significantly dropped to about $17.3 billion since the market crisis in June 2014 – Dangote has virtually achieved the impossible by building a multinational corporation in a generation. His vision is clear for all to see. He simply wants to become the richest man in the world and he would stop at nothing until he achieves his dream. The Kano born Nigerian businessman’s fortune surged 557% in 2010, making him the world’s biggest gainer in percentage terms and Africa’s richest individual for the first time. The catalyst was listing Dangote Cement, which integrated his investments across Africa with his previously publicly quoted Benue Cement company; it now accounts for a quarter of the Nigeria Stock Exchange’s total market cap. Already the continent’s biggest cement maker, he has plants under construction in Zambia, Tanzania, Congo and Ethiopia and is building cement terminals in Sierra Leone, Ivory Coast, Cameroun and Liberia, among other places. Aside the companies he has built from scratch and the billions of dollars he has made, the entrepreneurial life of AlikoDangote has been a source of inspiration to many youths in Nigeria. His business sense, strategies and advice has inspired thousands of Nigerian youths to be creative and think for themselves. Dangote success story dates back to his tutelage days under his grandfather Alhaji Sanusi Dantata, who himself was a multi-millionaire who grew rich trading commodities like grain oats and rice, and ranked as one of Kano’s wealthiest citizens. A 1995 trip to Brazil convinced him to shift from trading to manufacturing. His resolve was strengthened in 1999, when Nigeria held its first democratic presidential election in six years, choosing a bespectacled former military ruler and chicken farmer named OlusegunObasanjo, whom Dangote had known since 1981. As a key part of his platform, Obasanjo pledged to protect and promote domestic industry. Dangote Sugar started in 2000 and quickly expanded the annual production capacity of its refinery at Lagos’ Apapa Port to 1.44 million tons, enough to satisfy 90% of national demand. By the time Dangote Sugar debuted on the Nigerian Stock Exchange in 2007, sales had quadrupled to $450 million. The flour firm, which began in 1999 and also produces pasta and noodles, followed a similar trajectory. It began with a single mill, tripled revenue to $270 million, increased capacity eightfold to 1.5 million tons–then joined Dangote Sugar on the NSE in 2008, the same year Dangote became the first Nigerian on FORBES’ World’s Billionaires list, at No. 334. In 2005 Dangote secured a $479 million loan led by the World Bank’s International Finance Corporation – Nigerian banks didn’t have the ability, or the stomach, to put up the cash alone –and agreed to plunk down $319 million of his own money to build a cement factory. Recently, Dangote Cement made history again when on October 10, 2015; it commissioned its new 3-million-metric-tonnes-per-annum (mtpa) cement plant in Mtwara district, Southern Tanzania. This doubles Tanzania’s annual cement production capacity to 6 million mtpa, making it one of the few African countries that have attained self-sufficiency in cement production. Dangote, President/Chief Executive of the pan-African conglomerate, the Dangote Group, is the first African entrepreneur to lay claim to a $20 billion fortune as the stock value of the flagship of his holding. DangoteCement, leaped just about three-fourths since March, when Forbes last released its annual ranking of the world’s richest people. With a current market cap of $20.5 billion, Dangote Cement becomes the first Nigerian company to achieve a market capitalization of over $20 billion. The world renowned business and financial intelligence news magazine, the Forbes has reported that Dangote’s 93 per cent stake in the cement company is now worth $19.5 billion. Dangote is also leading the charge into the uncharted private refinery sector with the establishment of the $9 billion refinery and petrochemical plant original cited at Olokolo, Ogun state but later moved to Lekki Lagos. 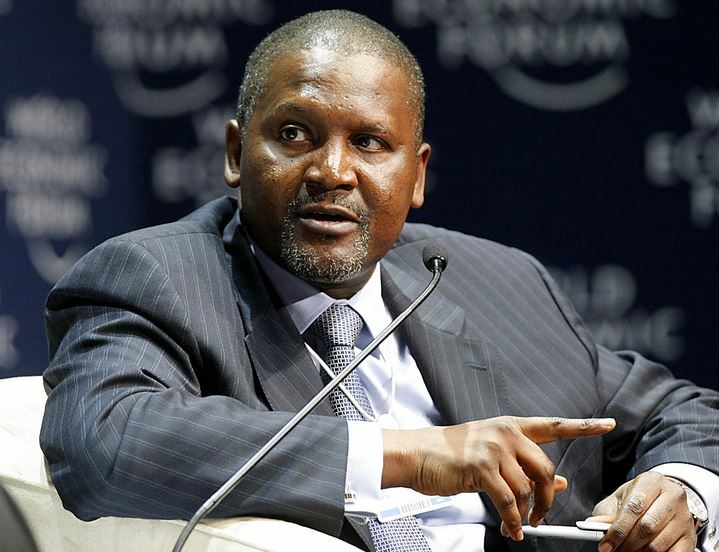 Added to this are his controlling stakes in other publicly-listed companies like Dangote Sugar and National Salt Company of Nigeria and his significant shareholdings in other blue-chips like Zenith Bank, UBA Group and Dangote Flour; his extensive real estate portfolio, jets, yachts and current cash position, which includes more than $300 million in recently awarded Dangote Cement Obajana, Kogi state as well as Unicem, Calabar. However, his dominance of the cement sector has been a long drawn battle with other cement makers, who often accuse him of monopolistic practices. Last year, Dangote was accuse by competitors when the NASS, on the instigation of the Standard Organisation of Nigeria, SON, passed a legislation stipulating new cement quality for the Nigerian market from 38 to 42 and 45. Also, the toward the end of the year announced a unilateral reduction in price of cement from about N2,200 to N1000 per bag.When the company said then it was in response to former President Jonathan’s challenge to the sector to reduce price to encourage the construction industry. But it was not to be as the company failed to implement the policy. Even, this year a similar price reduction policy was orchestrated by the company but again it faltered. Both actions cast a pale of dubious integrity on the company which seems to suggest a deliberate effort to manipulate and deceive. Nestle’s 2018 performance: In troubled times, don’t ruffle the boat!